If you love the flavors of Philly cheesesteak, you'll want to try this stuffed shell recipe. From the sautéed bell peppers to the creamy cheese sauce, this dish embodies some of the best parts of the famous sandwich. It's like a Philly cheesesteak that you can eat by the spoonful! Pressed for time? 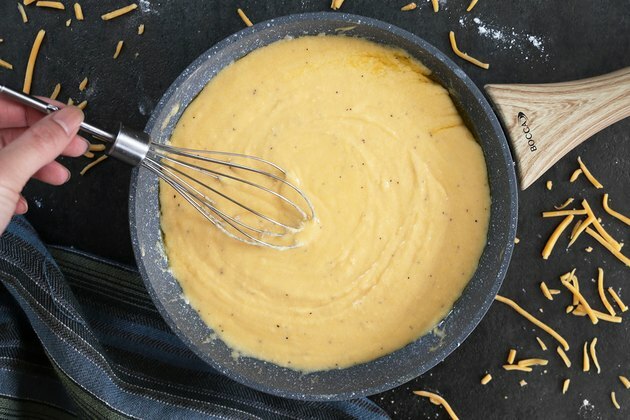 Skip the homemade cheese sauce and use Cheez Whiz instead. Another option is to use Provolone or American cheese like many restaurants in Philadelphia. 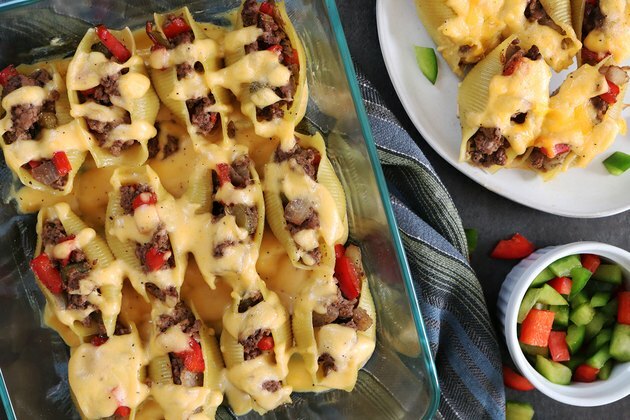 Whatever you choose, this Philly cheesesteak stuffed shells recipe is sure to be a hit. 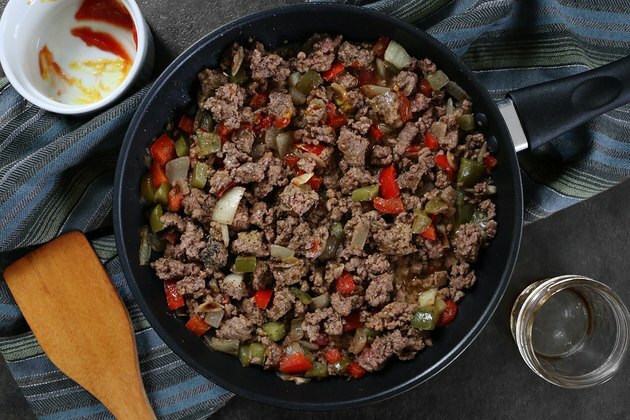 One pound of ground beef is enough for about 22 jumbo pasta shells. 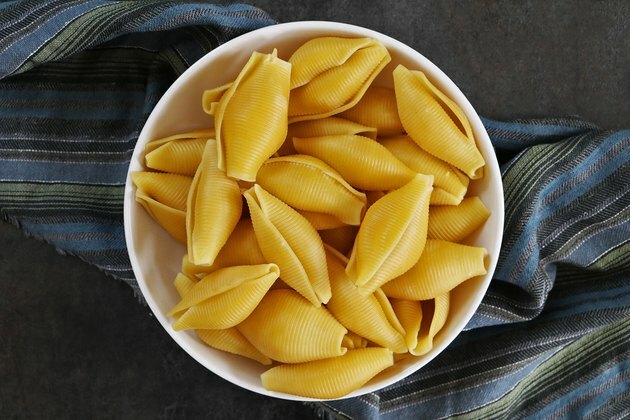 A 12-ounce box of jumbo pasta shells usually has 30-something shells. 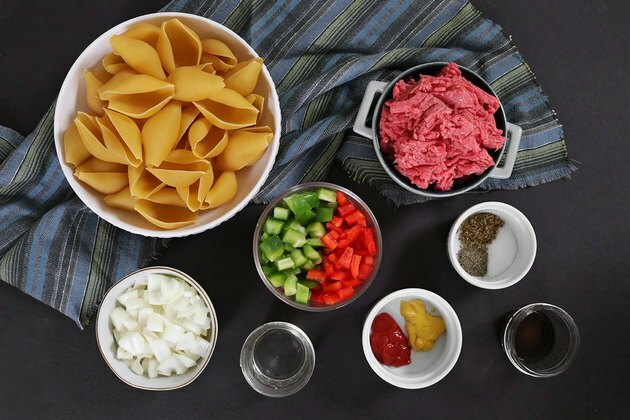 If you want to use all the pasta shells, you'll need a bit more than one pound of ground beef. 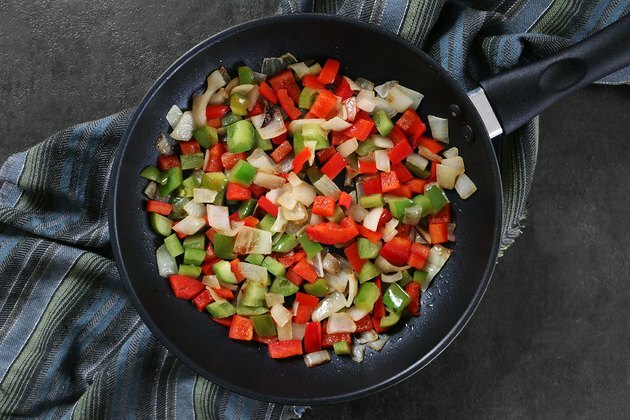 In a pan over medium heat, sauté the onion. Cook until slightly clear, about 5 to 7 minutes. Add the peppers and cook for another 5 minutes. Add the ground beef, ketchup, mustard, Worcestershire, and spices. Mix well and cook until the beef is completely brown, about 12 to 15 minutes. As the beef cooks, break it apart with a spatula. Make the pasta according to the package's directions. Over low-medium heat, melt the butter. 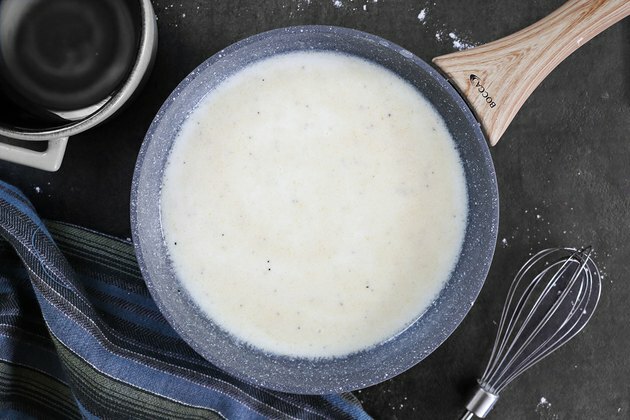 Add the flour, salt, and pepper and whisk until combined. Slowly add the milk. Whisk until smooth and thick, about 5 minutes. Make sure the milk doesn't boil. Otherwise, it might curdle. Add the cheese. Whisk until melted and smooth, about 7 to 9 minutes. 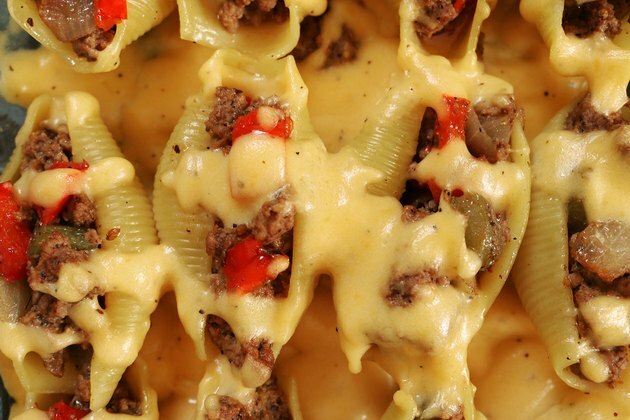 Once you've cooked the pasta, ground beef, and cheese sauce, you're ready to prepare the stuffed shells. 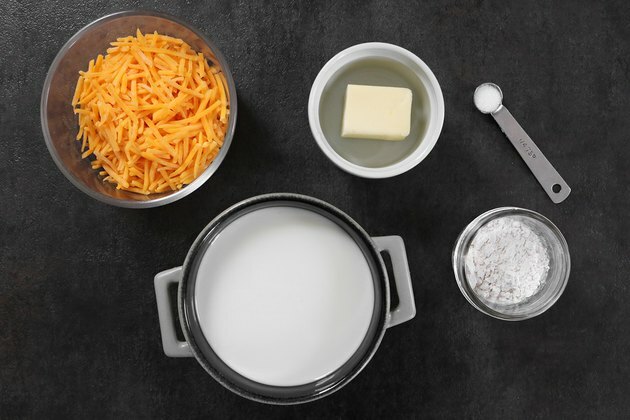 Scoop a thin layer of cheese sauce on to the bottom of a baking dish. 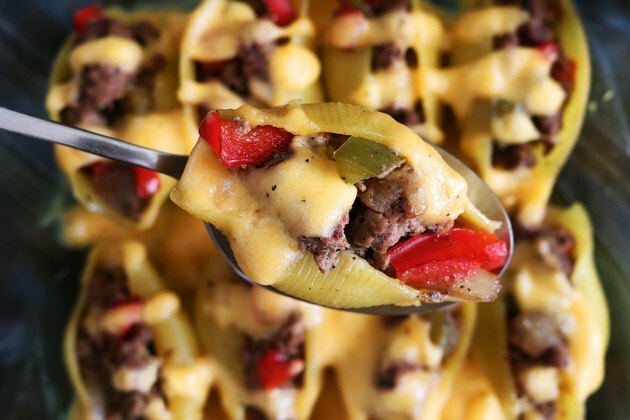 Fill the shells with the Philly cheesesteak filling. Place the shells in the dish and top with remaining cheese sauce. Bake for 10 to 15 minutes. Enjoy!